Laval Quebec is the largest suburb of Montreal and childhood home of Pascal Dupuis. Like every red-blooded Canadian boy he grew up playing hockey and dreaming of playing professional hockey. He played four seasons in the QMJHL but was never drafted by an NHL club. In August of 2000 at the age of 21, he was signed by the Minnesota Wild and spent a year of development in the International Hockey League before he became a regular player in the NHL. His early career was spent as an average player for several teams until, on February 9, 2008, he was traded to the Pittsburgh Penguins in the now infamous fi Marian Hossa trade. Dupuis has been a sold contributor since he helped the Penguins advance to the Stanley Cup Final in ’08 following his acquisition from the Thrashers. 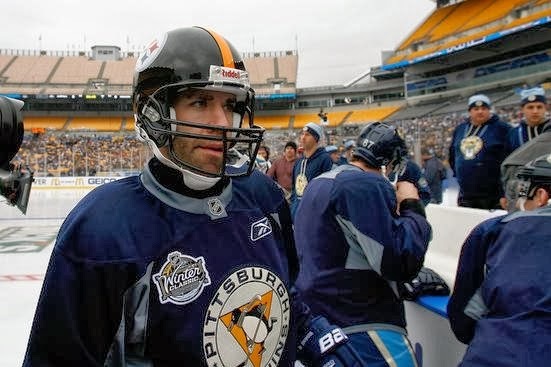 He was a key member of Pittsburgh’s 2009 Stanley Cup championship squad, appearing in 16 playoff games that spring and famously had Lord Stanley’s cup tattooed on his shoulder that year. At 34, the 6-foot-1, 205-pound Dupuis has, like a fine French wine, developed character with age. He’s versatile with impressive speed and a big shot. He’s a scorer with a role player’s mentality. He kills penalties, grinds in the corners and seemingly only knows how to play full tilt. He wears a cross around his neck that he kisses four times before the puck drops, once for each child he and wife Carole-Lyne have. He is a respected voice in the locker room and a notorious prankster. 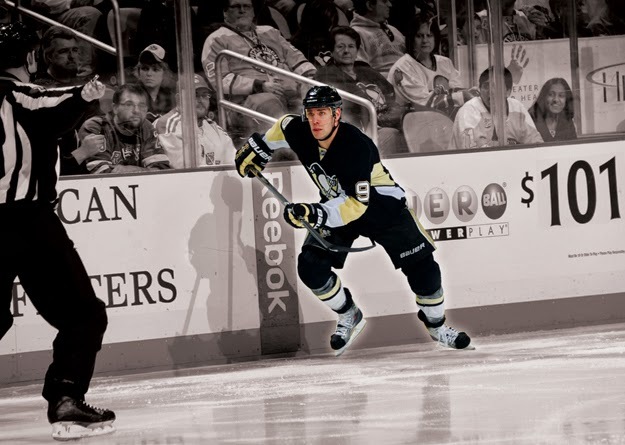 His favorite target; Sidney Crosby. Pascal has been Sid’s road roommate for quite some time. 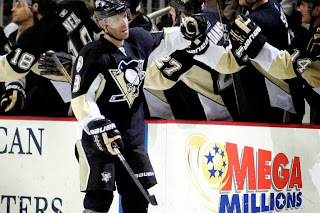 “Sometimes I mess with him simply to mess with him,” Dupuis has explained. “Sid is pretty superstitious, to say the least. There are a couple things that are off-limits and a couple things you can have fun with” he told Sean convoy of Pittsburgh Magazine. You may wonder if Crosby ever ventures to the Dupuis home for dinner with the family of 6. "I have a black cat, so he won't come over," Dupuis has explained to the Post-Gazette. "It's been a year and a half, he hasn't been over. I have two [large] Bernese mountain dogs and he was over, but just a little darker looking cat and he hasn't been." For three seasons, hockey fans in Pittsburgh clamored for a winger for Sid. They accepted Kunitz when he was moved from Malkin’s line but just couldn’t seem to come to terms with Dupuis as a worthy line mate for Crosby. There was no denying that Dupuis was a big contributor with 36 blocked shots and average of 1:55 shorthanded minutes per game. 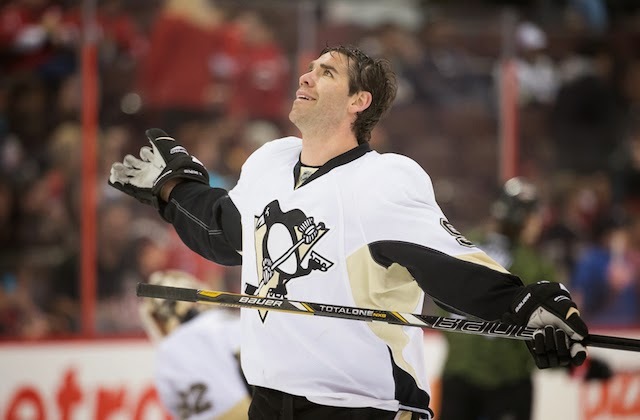 [During the past three seasons, Dupuis’ eight shorthanded goals were tied for most in the NHL.] Even when he had his best NHL season in 2011-12, establishing career highs across the board in goals (25), assists (34), points (59), game-winning goals (2) and shots (214) while appearing in all 82 regular-season contests, Yinzer Nation still asked, “What about Zach Parise?” He finished the ’11-12 season riding a league-best and career-high 17-game point streak – the second-longest streak in the NHL over the previous three years behind only line mate Sidney Crosby (25 games; 2010-11 NHL.com) Yet, everyone foamed at the mouth over Iginla in the spring of this year. 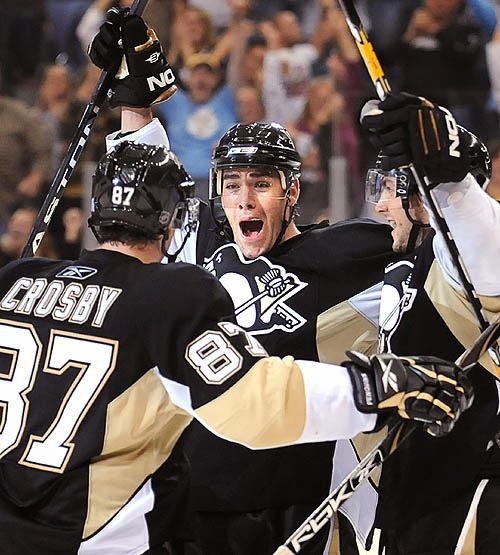 The line of Kunitz, Crosby and Dupuis combined for 57 goals and 146 points during the abbreviated lockout season. Their chemistry is undeniable on the ice but they each say that they genuinely like each other outside of hockey. Kunitz told the Post-Gazette: "I think that's part of the chemistry of building a team," Kunitz said. "If you're happy and having fun, guys usually have more success. “I think everybody knows [Dupuis] has that fun character, an outgoing locker-room kind of guy. Me and Sid are a little more reserved in that area. Outside of the rink, we get along really well." This summer he re-signed with the Pens right at the free agency dead line. Before he signed was quoted by Prohockeytalk.com as saying “Obviously, I want to stay a Pittsburgh Penguin,” Dupuis said. “I’ve said before, my wife and my kids love it around here. I have friends away from the hockey world that I want to be part of their life still.” He inked a deal that runs through the 2016-17 season and has an average annual value of $3.75 million. What makes an undrafted guy from Laval Quebec worthy of a spot on a line with arguably one of the greatest players in the game today? Is it that he wore a Steeler helmet onto the ice at Heinz field during the Winter Classic? Is it the way he rigged the toilet to spray (clean) water all over 87? Is it the way he kills penalties like he’s defending his children? Is it that he played his 800th career NHL game this past week? Maybe it’s all that and he just happens to be a pretty good hockey player. Did I say good? I meant Super Duper.